(Ottawa, ON) On Wednesday, November 2, the Government of Canada, in partnership with the Canadian Olympic and Paralympic Committees, hosted more than 250 Canadian athletes and coaches in Ottawa and Gatineau to celebrate their achievements at the Rio 2016 Olympic and Paralympic Games. Paralympians David Eng, Tracey Ferguson, Erica Gavel, Cindy Ouellet and Amanda Yan were in attendance to represent the Canadian men’s and women’s national wheelchair basketball teams. The celebration began in the morning at the University of Ottawa and the Centre sportif de Gatineau where Olympians and Paralympians engaged with local students. At the University of Ottawa, students and athletes were surprised with a visit from Prime Minister Justin Trudeau who joined in on the sport activities and took a moment to address the excited crowd. The athletes and coaches then attended a luncheon hosted by the Honourable Carla Qualtrough, Minister of Sport and Persons with Disabilities, where they received their Olympic and Paralympic rings, and David Eng and his fellow flag bearers each received the James Worrall Flag Bearer Award. Finally, the athletes and coaches were welcomed into the House of Commons to be honoured by all members of Parliament. The House rose in extended applause as each athlete paraded across the floor, an honour reserved for only very special guests. 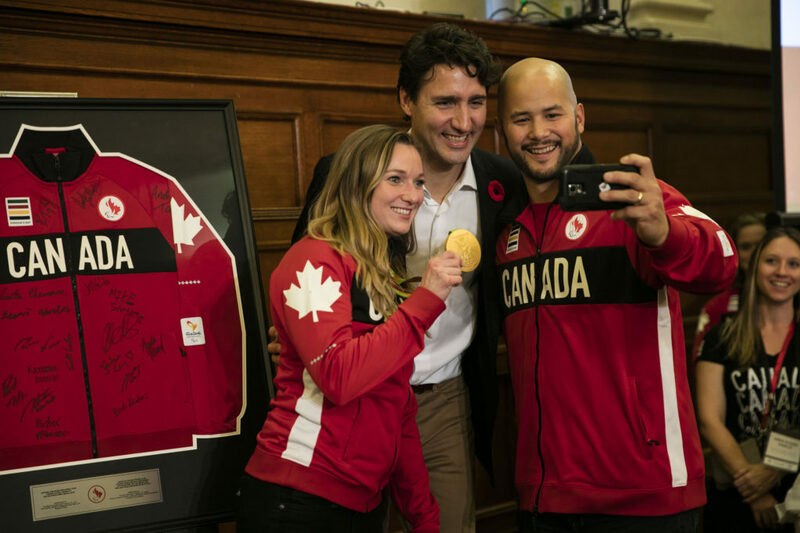 Paralympian Tracey Ferguson grabs a selfie with PM Trudeau.